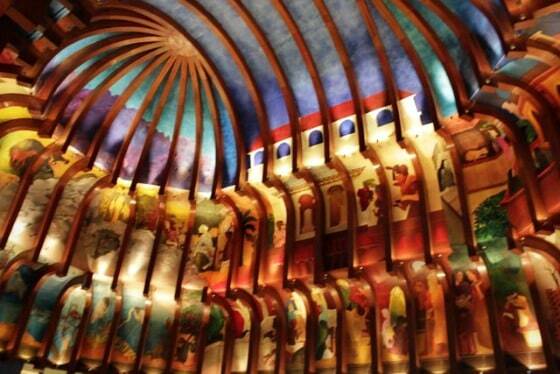 The Procession of Life by Krishen Khanna adorns the ceiling of the ITC Maurya’s grand lobby. I always wanted to live in a hotel, like Eloise at the Plaza. As someone who is essentially a free spirit, and who feels somewhat homeless, hotels take on an added significance to me. They virtually become my home when I move in. This explains why I pack so much! And it explains why I am fascinated by large, five-star hotels. So I was thrilled when the ITC Maurya in Delhi, India invited me to stay for one day, 24 hours, and experience one of India’s leading hotels. 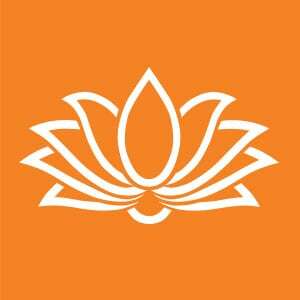 And if you don’t know, leading hotels in India are among the world’s best — they enthusiastically live up to the Atithi Devo Bhava motto: Guest is God. And that’s exactly how I felt! 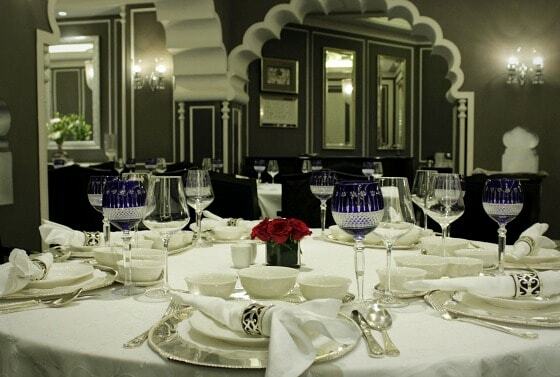 The first thing you need to know about the ITC Maurya is that it is an iconic mainstay in Delhi. Among many other heads of state, the last three U.S. presidents have stayed there (George W. Bush famously shutting down the entire hotel and turning it into a fortress), and so has, very recently, Canada’s prime minister Stephen Harper. 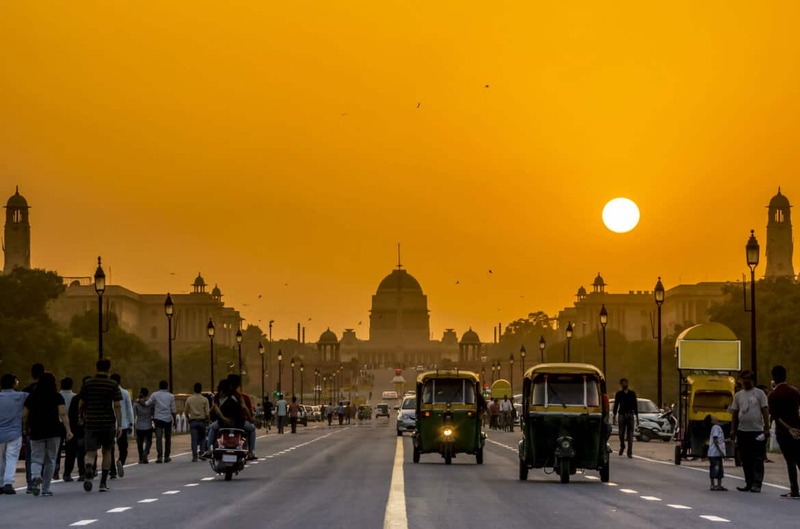 The two signature restaurants, Bukhara and Dum Pukt, are considered two of the finest in Delhi; in India; and even in the world. Bukhara invariably makes it into lists of the top 15 restaurants of the world. President Obama slept here! The presidential suite at the ITC Maurya Hotel in India. The hotel also contains a very fine art collection — in fact, the lobby is a work of art in its own right. 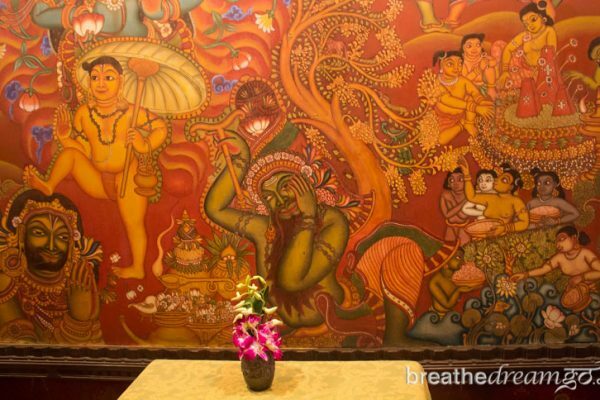 The vaulted ceiling, inspired by Buddhist stupas, is adorned with a stunning mural: the ‘procession of life’ painting by Krishen Khanna, which was modelled on the ancient Buddhist Chaitya cave temples in Karla, Maharashtra. The lobby also features a stained glass series of panels on the life of Buddha by legendary painter M.F. Hussain. 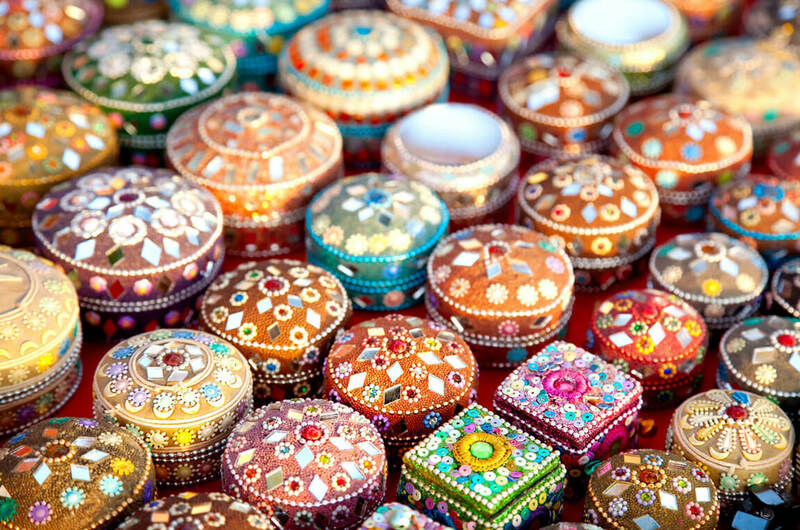 Art work is displayed throughout the hotel, along with the theme — the Mauryan Dynasty, a golden age of art and architecture in Indian history. 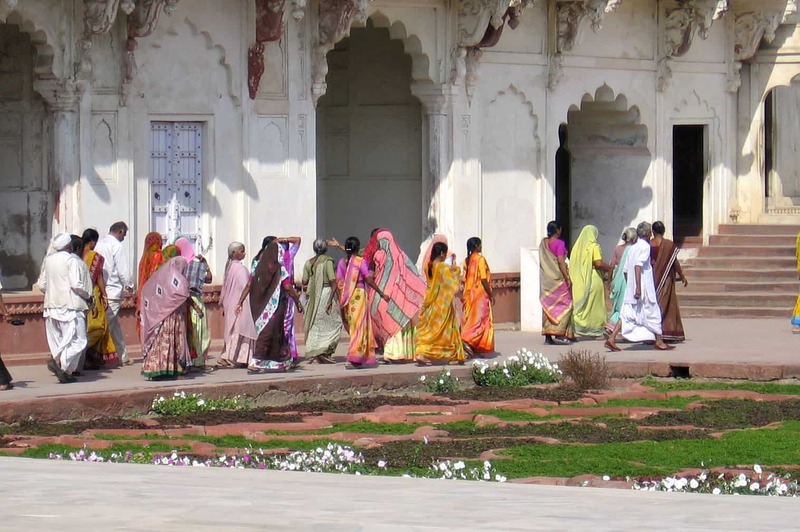 Follow my South Asia Sojourn from October 2012 to May 2013 — a six-month blogging trip through India, followed by a search for my family roots in Ireland. Subscribe to Breathedreamgo in the “Get updates by email” box to the right. Join the Breathedreamgo Facebook page; and the Breathedreamgo Twitter stream (hashtag #BDGIndia). A surprising welcome awaited in my room! The rooms, the amenities, the service — all of it is absolutely first class, which is to be expected in the ITC Hotel chain’s flagship property. The attention to detail is mind-boggling. 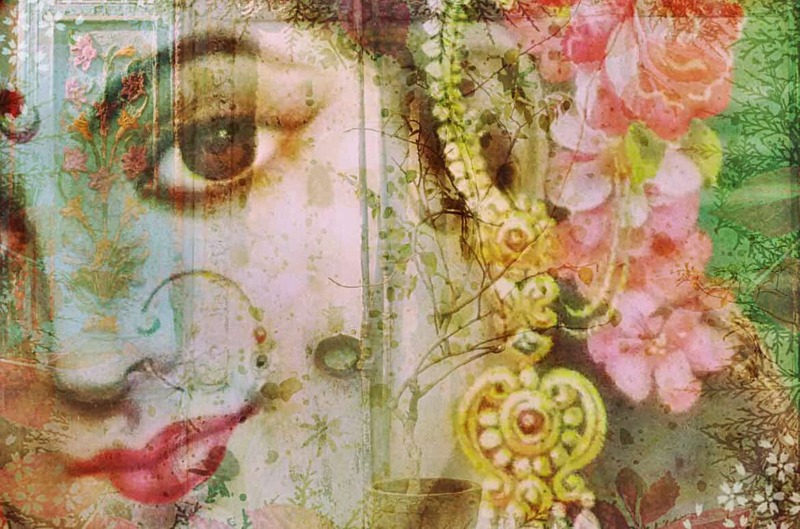 When I arrived, I was greet by person after person, and each knew my name; and then I was swathed in a long silk scarf. I was shown to my room on the Eva floor for single women travellers, and introduced to my lady butler, Easther (pronounced Esther), a very cheerful woman with a can-do attitude. 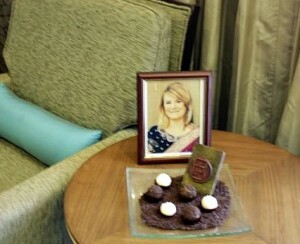 In the room, there was a framed photo of me in my silk sari (my official photo) a plate of sweets and fruits, and a tray of handmade chocolates. The room was luxurious and cosy and had every amenity a woman traveller could think of, including a tray of toiletries, robe and slippers, a selection of pillows, a circular rain shower PLUS deep tub, everything needed to make tea and coffee, a large screen TV and on and on … The Eva floor is off-limits to men, and is patrolled by a female security guard. 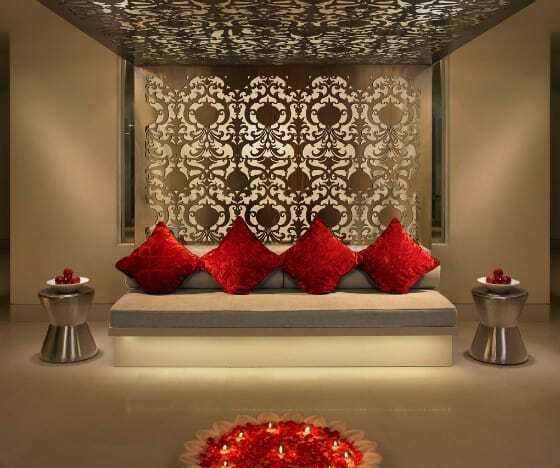 Reception area for the Kaya Kalp spa at the ITC Maurya. 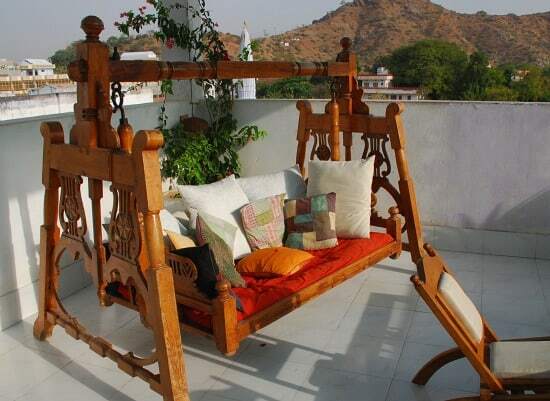 Photo courtesy ITC Maurya. My visit started with lunch at the Pavilion, a multi-cuisine, fine dining restaurant off the main lobby, with Richa and Samar from the PR department. The chef had learned of my gluten-free diet and made me a complete gluten-free meal — including bread. I was delighted to meet the senior executive chef, a woman named Manisha Bhasin — a woman executive chef is rare even in the west. Then I was given a tour of the hotel, including the art collection and the presidential suite, which is like a very large and very tastefully designed apartment complete with dining room, office, several bedrooms and the most gorgeous bathroom I have ever seen. After relaxing for awhile in my room, I visited the Kaya Kalp spa and had perhaps the best massage of my life. After the massage I enjoyed the steam room, sauna and whirlpool. 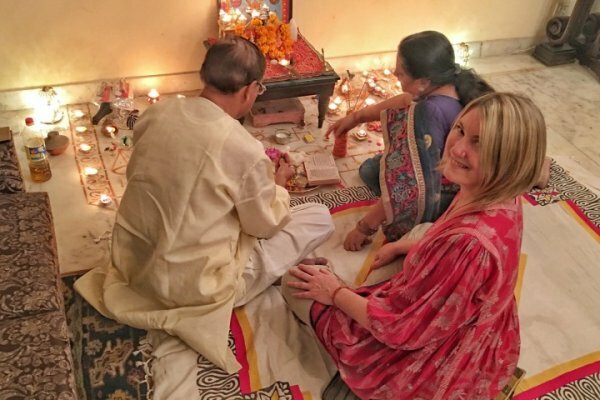 I have been in various spas and health centres in India and I have to say that most of the time, they do not come anywhere near to western standards: spas are new in India and not usually well executed. But the spa at the ITC Maurya was as good or better than any I have ever experienced anywhere. 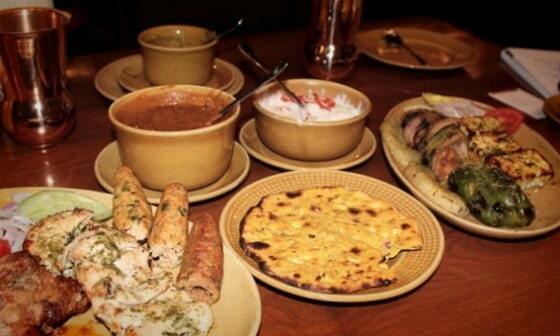 Simple, tasty, fresh and perfectly cooked: The rustic food at fabulous Bukhara. Photo: Andrew Adams. I was really looking forward to dinner as I have been hearing about the hotel’s famous restaurant, Bukhara, for years. But I really didn’t know what to expect. I invited my friend, photographer Andrew Adams to join me. We were greeted by the very gregarious maitre d’hotel, Kawaljit Sigh, the face of Bukhara, who has been with the restaurant for 31 years — from the very beginning. The executive chef, J.P. Singh, has been there for 21 years. I kept hearing this, throughout the hotel: people become part of the ITC Hotels family and they don’t leave. Some serve their entire careers there. The warmth, passion, pride and dedication of the staff is evident. 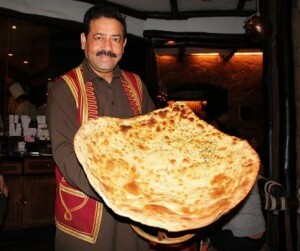 The “family sized naan” bread at Bukhara. Photo: Andrew Adams. We were shown in and told we would have a memorable meal. It was indeed. Plate after plate of simple, abundant, and perfectly prepared food kept appearing on the table. Bukhara is a surprisingly causal and down-to-earth place. The menu has never changed. The restaurant serves food from the northwest frontier — meat kebabs, thick bread, tandoori cooked foods, dal, paneer — cooked behind glass in an open kitchen. The seating is just benches and stools, and everyone is encouraged to eat with their hands. The assistant manager Karanbir Singh Gulati explained to me that eating with the hands is healthful and helps you digest; each finger represents one of the five elements. Though the food is simple, and hardly gourmet fare, I do have to concur: it was the best paneer, dal and raita I have ever eaten, and the tandoori prawns were the size of large lobster tales and to-die-for. Andrew and I went crazy for them. Hard to say exactly why everything is so good; but everything was fresh, abundant, perfectly cooked. The chef told me the secret is the slow cooking and the very high-quality and standardized ingredients that they start with. The fun atmosphere also helps: huge family-sized naan bread was paraded out of the kitchen, the chef brandished massive skewers of food, brass finger bowls were proffered … it was indeed a memorable experience. After saying goodnight to Andrew, I retired to my room to discover turn-down service is a bit more than just a chocolate on the pillow: there was a tray with tiny bottles of calming room spray, ear plugs, an eye cover and other amenities to make you feel at home, calm, and relaxed. 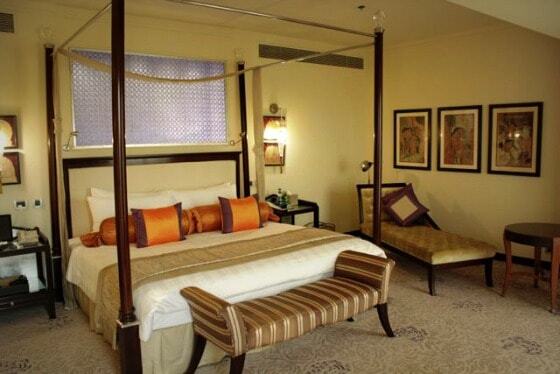 ITC Hotels wants you to sleep like a baby, and I did. The bed was fabulously comfortable and there was not a sound in my room. 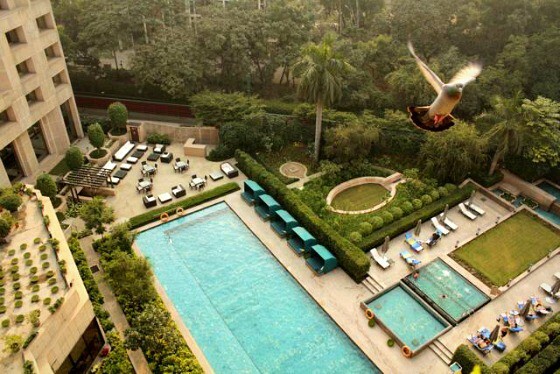 A view of the pools from a rooftop terrace of the ITC Maurya. In the morning, after eating a very light breakfast of fruit and sweet lassi in my rom, I worked out in the gym and then hit the spa for the sauna-steam room-whirlpool combo; and then shocked the Indian guests and employees by going for a quick swim in the pool. November is winter to them, but to me, a Canadian, it was like a balmy summer morning. Finally last, but MOST certainly not least, I had lunch in Dum Pukt before departing. I think Dum Pukt is the most elegant restaurant I have ever seen. If Bukhara is rustic, Dum Pukt is regal. An opulent study in gleaming silver, rich dove grey, sparkling glass and crisp white linen, Dum Pukt exudes refinement. Even the menu is beautifully crafted and printed on embossed paper, perfect bound like an art book. But at Dum Pukt too, it’s all about the food. And the food has a story and a history that makes it meaningful as well as extremely tasteful: in olden times, during a famine, a Nawab of Oudh (present day Lucknow) wanted to feed his people without giving them charity. He initiated a building project and asked everyone to come and work on it, and he then fed whoever came. With thousands to feed, he ordered that food be cooked in large pots sealed with dough, all day long over an open fire. Over time, the cooking method was refined and became the staple of courtly cuisine in the region. The words “dum pukt” refer to the cooking method. Elegant dining and sumptuous food at Dum Pukt, my new fave Indian restaurant. So, this is what they still do today at Dum Pukt: they slow-cook food in “deghs” (pots), sealed with dough to trap all the flavours. They also served me light and fluffy vegetable kebabs — I had no idea kebabs could be so delicate! — and a steaming vegetable biryani, accompanied by small bowls of various chutneys and sauces, including a divine pineapple chutney. And with that lunch, one of the best I have eaten in my life, I was on my way. Even though I stayed only for 24 hours at the ITC Maurya, I felt totally immersed in the experience, and was able to soak up the ITC Hotels corporate culture. Over and over again, the various employees I talked to told me they felt like they belonged to a family. Certainly the staff turnover is very low, and the attitude towards work, service and attending to guests is about the best I have seen in India (or elsewhere, for that matter). When I was leaving, I told several staff members that I, too, felt almost a part of the ITC Hotels family, and I was sorry to go. Easther and me at the ITC Maurya: I wanted to take her with me! My lady butler Easther helped me pack and even accompanied me to the train station, where she engaged a porter for me (and talked him down from 200 to 100 rupees!). I have never before had such service! Of all the amazing people I met at the ITC Maurya, including chefs, public relations people, a massage therapist, waiters, hostesses, managers and more, I think I will miss Easther most. Her sunny disposition and helpfulness, plus her organizational skills, made her invaluable and I was starting to rely on her. Why oh why can’t Easther travel with me and help organize my life?!?!? So, thank you to ITC Maurya for hosting me for 24 hours and making a hotel dream come true for me. NOTE: To see more of photographer Andrew Adams work, visit his website, here.